Singaporean healthy dish, Yong Tau Foo. The wonderful thing about this recipe is you can experiment with stuffing any vegetables that you like. I choose brinjal and red chillies. 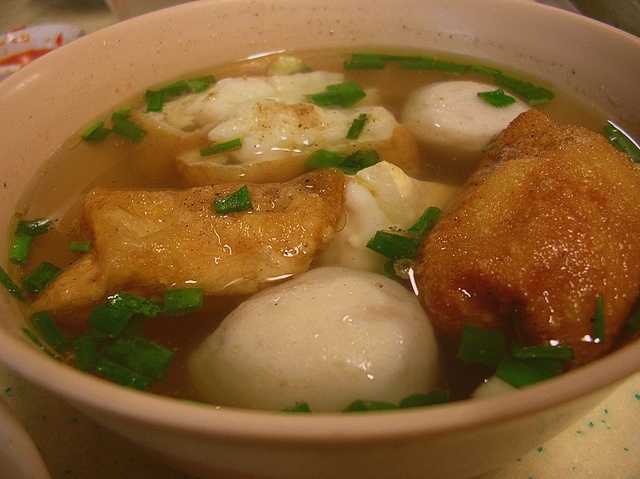 Recipe for Yong Tau Foo ??? Scald chicken breast and 400g of chicken thigh with boiling water to remove blood traces excess oil for clear stock. Place chicken breast and chicken thigh together with all other stock ingredients into a pot. Bring to boil and simmer for at least 4 hours. Mix all ingredients for meat paste. Make a horizontal slit for green chillies, tau kwa and tau pok. Stuff vegetables with meat paste. Bring stock to boil and add stuffed bittergourd and shitake mushrooms into the soup. Simmer for 15 minutes. Bring stock to boil once more and add stuffed chillies, tau kwa, tau pok and xiao ba cai into the soup. Simmer for 10-15 minutes. Serve garnished with coriander and fried shallots. Oh wow… alot of effort went in for this yong tau foo! I’m really amazed at your amazing culinary skills! Your girl sure is lucky! Hope you like it. Most recipes are versatile. You are wellcome for feedbacks. You can always make the dish better to suite your own taste.